Kitchens are places where storage, no matter how plentiful, never seems to be enough. But more storage space does lurk, frequently unused. 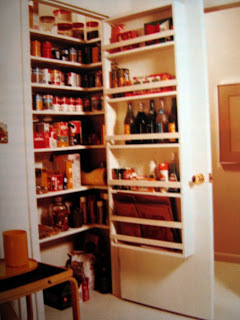 In a pantry or a broom cupboard, behind an entry door or in many other convenient, out-of-the-way spots. 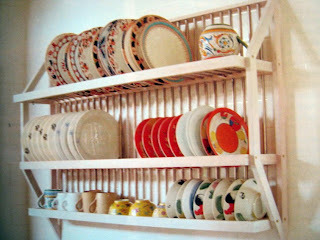 Here, a shelf unit 90x19mm (finished size) comprising frame, shelves and ledgers with 42x12 mm retaining strips, is fixed easily and unobtrusively behind a pantry door. The size of the unit and the spacing of the shelves can be modified to suit your particular needs. Keep in mind that you could use 142x19 mm material for greater storage if there is sufficient room. If the door is hollow core (which is more likely) use spring or gravity toggles. To install these, bore a hole in both the ledger and door to the recommended diameter. Take the metal screw out of the toggle, push it through the ledger, and refix it to the body of the toggle. Position the unit and push the body of the toggle into the holes in the door. Then, simply tighten the metal screw. The wings on the back of the toggle will tighten against the back of the door facing, suspending the unit solidly and permanently. Now fill the shelves with those essential items and forget about your storage problems. Cover the shelves with plastic sheeting. This will help stop paintwork being damaged. Do you have some wasted space between two top cupboards or between a top cupboard and a corner? Why not put up some shelves? A great effect can be achieved for little cost. Materials for shelving may be solid timber, glass, plywood, timber veneered or plastic-laminate-covered particle board, among other things. Each product comes in a variety of widths, thickness and lengths. Standard lengths start from 600mm and generally go up to 3600mm in 300mm increments. Common widths are 150,200,250,300,450 and 600mm. The width and thickness you require have to relate to the size and weight of objects which the shelf has to carry and the spacing of the supports. Be realistic about the probable loading; it is best always to alert on the side of safety.